Where molecular and conservation biology meet, a new scientific field is emerging: De-extinction. Scientific and technological advances are making the prospect of reviving extinct species a realistic goal. 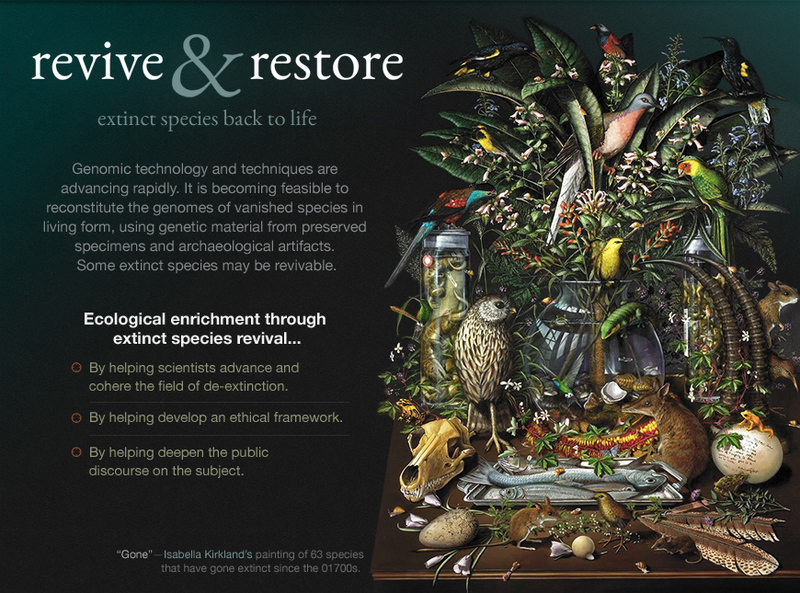 Revive & Restore is a project of The Long Now Foundation that seeks ecological enrichment through extinct species revival. A private meeting last fall, jointly organized with the National Geographic Society, brought various practitioners in this burgeoning field together to discuss challenges, long-term goals, best practices, and ethics. As an outcome of that private meeting, the NGS offered to host a public forum to further explore the science of de-extinction and promote dialog on the ethical issues surrounding it. 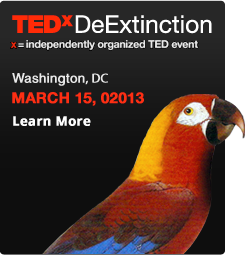 an independently organized TED event at Grosvenor Auditorium in Washington, DC. Featuring Carl Zimmer, George Church, Revive & Restore’s own Ben Novak and 22 other speakers, it will be a daylong extravaganza of de-extinction science, art and ethics. On the TEDxDeExtinction website, you can learn more about the event, buy tickets to attend in person, or sign up to host a livestream viewing party. Keep up with announcements related to the event on Twitter and Facebook. Prior to TEDxDeExtinction, on Wednesday 2/27/13, Revive & Restore (and Long Now) co-founder Stewart Brand will appear at TED to give a talk on the increasing feasibility of bringing back extinct species.